Harry Gregg was born in Derry, Northern Ireland on 25 November 1932. Gregg is a survivor of the infamous Munich air disaster in 1958 and is sometimes referred to as the 'Hero of Munich' although it is not something that sits comfortably with him. Gregg was a very good goalkeeper that had crossed the Irish Sea to join Doncaster Rovers when he was an eighteen year old. Harry Gregg signed for Matt Busby's Manchester United in December 1957 for a World record fee, for a goalkeeper, of £23,000. Harry Gregg made his debut for Manchester United on 21 December 1957. It was a First Division tie against Leicester City at Old Trafford and Gregg kept a clean sheet as United ran out 4-0 winners. Less than a dozen matches into his Manchester United career Harry Gregg found himself on BEA Flight 609 refuelling at Riem Airport in Munich on 6 February 1958. The Manchester United team was on the way back from Belgrade having qualified for the semi-finals of the European Cup. Following two failed attempts by the flight crew to get the plane airborne again, due to bad weather, the atmosphere on the aircraft was very tense. Gregg who had been reading The Whip by Roger MacDonald put the book down and gazed out the window as the third attempt to take off got underway. The plane crashed into a building at the end of the runway and burst into flames. Amid the wreckage and pandemonium Harry Gregg repeatedly returned to the burning aircraft and dragged United players, Bobby Charlton, Dennis Viollet, and fellow Northern Irishman Jackie Blanchflower, from the wreckage. He also saved Vera Lukic, the pregnant wife of a Yugoslav diplomat and her daughter, Vesna, as well as his badly-injured manager Sir Matt Busby. 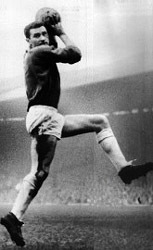 Amazingly Gregg played in United's next match on 19 February 1958 in a 5th round FA Cup tie at Old Trafford. Equally amazingly the decimated Manchester United team beat Sheffield Wednesday 3-0 that night. Harry Gregg played for Manchester United 247 times over an almost 9 year period. Despite the fact that this was a quite successful time for United Harry Gregg failed to win any major medals or honours. His only appearance in an FA Cup final, in 1958, was marred by concussion and ultimately defeat at the hands of Bolton Wanderers. He missed out on the 1963 FA Cup final victory through injury. Due to a series of different injuries he did not make enough appearances to collect winners medals in the 1964-65 and 1966-67 title-winning campaigns. Despite this, many people of that time regard Gregg as the greatest goalkeeper to ever play for the Red Devils. Harry Gregg made his last appearance for Manchester United on 7 September 1966 in a 3-0 defeat by Stoke City at the Victoria Ground. Gregg subsequently signed for Stoke City on a free transfer however he only made two appearances for the Potters. Harry Gregg made his international debut for Northern Ireland on 21 March 1954 in a World Cup qualifier away to Wales. Northern Ireland won 2-1. Gregg went on to play for his country 25 times keeping four clean sheets. His appearances for Northern Ireland include four appearances in the 1958 World Cup finals in Sweden. When the all-star team from the tournament was voted on by the journalists covering the event, Harry Gregg got 478 votes which was substantially ahead of his closest competitor the great Russian keeper Lev Yashin who received just 122 votes. Harry Gregg's last appearance in the green of Northern Ireland was on 20 November 1963 at Wembley Stadium. Unfortunately for Gregg his last appearance was an 8-3 humiliation at the hands of the English.